Hedgehog Cactus: They have several one to two inch long spines on them thus the common name. Native to Central Mexico to the Western United States, there are about 50 cactus species common named Hedgehog Cactus. Barrel Cactus: Native Americans used this cactus as a cooking pot. It is also known as Candy Barrel Cactus as its pulp has been used to make cactus candy. Saguaro Cactus: The tallest cactus that grows very slowly. It produces edible fruit that ripens in June, this fruit is highly prized by locals. A single fruit can contain up to 4,000 seeds. Star Cactus: It is a small, spineless cactus with a circular body that grows about 2-6 inches in diameter and about 1-2 inches tall. They bloom from March to May and fruits from April through June. Prickly Pear: A very common cactus, also known as tuna nopal or paddle cactus. Organ Pipe Cactus: It is considered the second tallest cactus after Saguaro Cactus, growing as tall as 23 feet. It produces edible fruits which lose their spines upon maturity and display an edible red pulp. This fruit is a food source for native Americans. Light: Strong light is essential for healthy cacti, especially in the winter. Some species may scorch in direct summer sun if they haven't been hardened off first. Temperature: During the active growth period, cacti prefer hot, dry temperatures, ranging from 70ºF to more than 80ºF. In the winter, the plants prefer a cooler period, down to 55ºF. In their desert habitats, many cacti are accustomed to very chilly nights. However, protect them from very cold winter drafts. Water: In the spring and summer, when the plant is actively growing and/or blooming, water whenever the compost begins to dry. During these waterings, make sure the plant is thoroughly watered. During the winter rest period, nearly cease watering. Only water if the plant begins to shrivel. Potting Soils and Repotting: Pot into a fast-draining cacti mix. If one is not available, amend regular potting soil with inorganic agents like perlite to increase drainage and aeration. Cacti are generally slow-growing plants and will rarely need repotting. Also, remember that many species of cacti will bloom better when they are slightly underpotted. Fertilizer: Use a cacti fertilizer during the growing season. Some growers have poor results with standard fertilizers, so it's probably worth it to seek out a specialized cacti fertilizer. Common Problems: The most common mistake with desert cacti is overwatering in the winter, which will cause rot either at the base of the plant or at the tips of the growing areas. If the rot is advanced, it might be necessary to start new plants from cuttings or discard the whole plant. 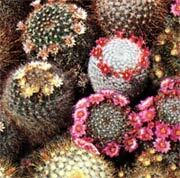 Cacti are also susceptible to pests include mealy bugs and mites.